The Chhairo Gompa complex is a Buddhist center of learning in Nepal’s Lower Mustang Valley. 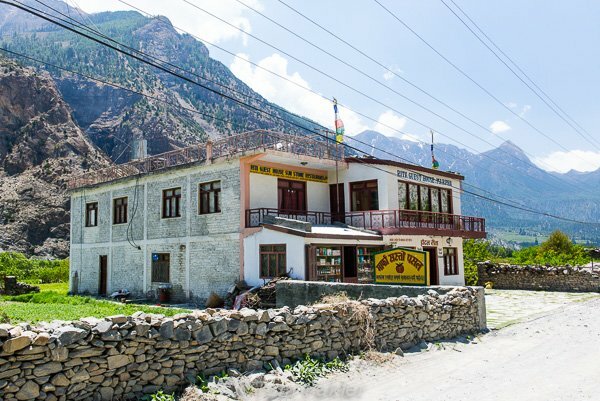 Located south of Marpha on the Kali Gandaki River, the remote site is tucked away in a grove of spruce trees, about a kilometer east of the famed Annapurna circuit trekking trail. 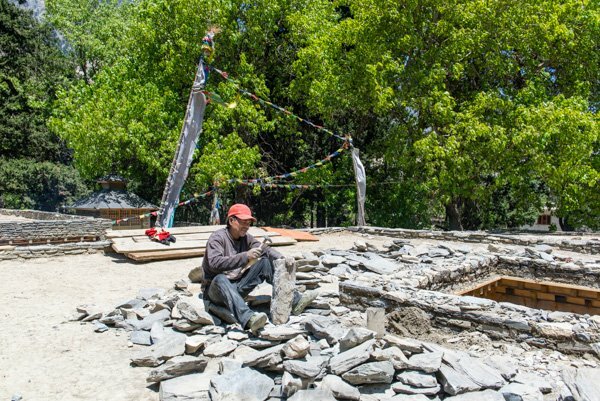 From 29 April through 10 May 2013, I joined a group of volunteers helping to restore the gompa. Chhairo Gompa was once a thriving and influential community center for the local population, but its use gradually declined as historic trade routes became less traveled. After monks departed, and the gompa was given into the hands of local caretakers, only the core shrine rooms and courtyard were maintained. Fast-forward to the 1990s, when Lower Mustang native and monk Shashi Dhoj Tulachan spearheaded efforts to return the gompa to its former glory. Within a few years, restoration work had begun, and in 2004, a long-term project to revive the monastic community in new quarters was underway. 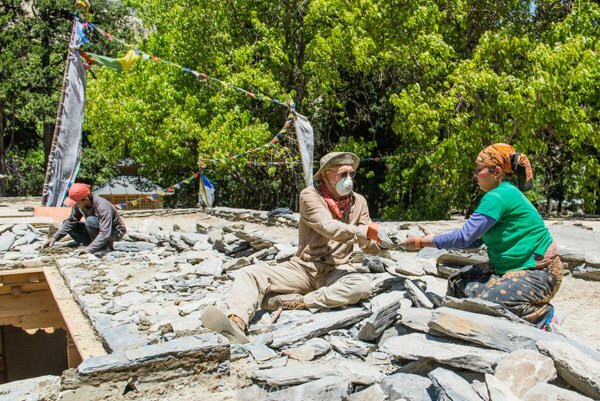 For nearly a decade, volunteers from Restoration Works International (RWI) have been traveling to Lower Mustang, lending their efforts to the ongoing project. When work began, most of the gompa was in ruins, with just two main temples and interior courtyard buildings standing. Today the rubble of the old complex has been removed and replaced by a new stone structure to house gyalpos, or protector deities, as well as quarters for monks and a library. Volunteers in our group were tasked to test various ways to clean statues in the gompa, with least damage to the objects. 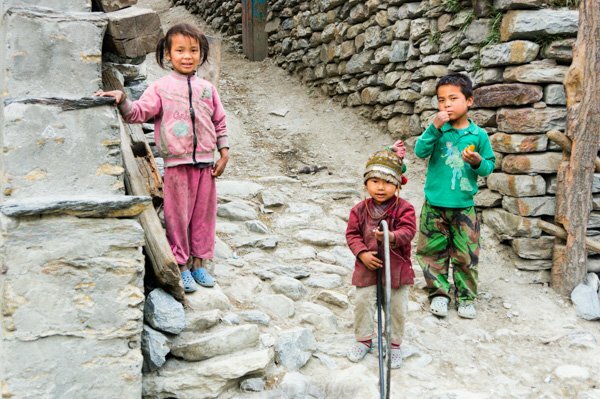 When I signed up for the RWI project, almost 85% of my registration fee went directly to Nepal. More than half was for project expenses: helping cover wages for local staff, and costs for building materials and supplies. 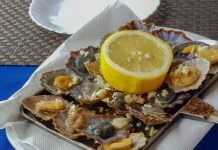 The rest covered my in-country expenses for transportation, food and lodging. 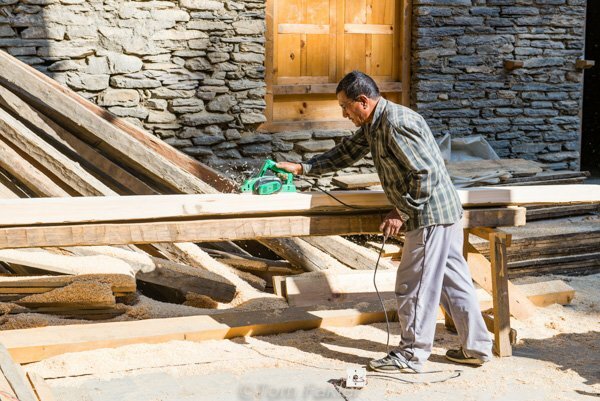 Local workers–including stone masons, carpenters and plasterers–provide the majority of the skilled labor for reconstruction of buildings in the complex. Construction materials are purchased locally, to keep transportation costs down, and to infuse the local economy. Workers plane rough-cut timbers to be installed as beams for the balcony above the courtyard. RWI volunteers stay in a simple, but comfortable, guesthouse in nearby Marpha. The opportunity to forge personal relationships with the Nepalese working on the project is a highlight of RWI volunteer trips. Three of the volunteers in our group had participated in prior restoration trips to Chhairo Gompa. Our group worked alongside locals, supplementing their labors. We plastered, cleaned ancient statues, cut stones for walls and prepared walls for painting. 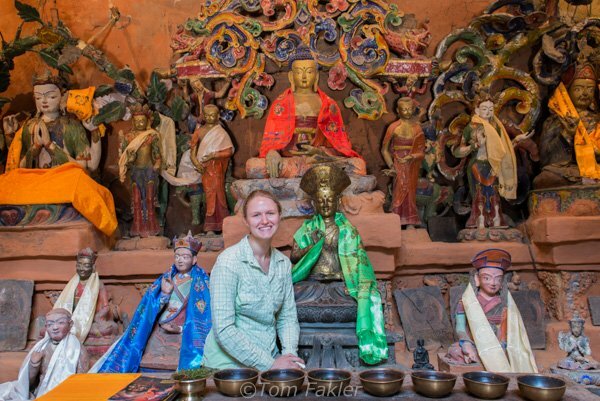 Returning volunteers reunite with old friends at Chhairo Gompa. Volunteers sift sand with the local workers, who will added cow dung and water to make traditional plaster, to be spread on the wall by hand. The walls and ceiling of a new library are almost finished, ready for the skylight to be added. The local stone mason uses traditional methods to lay up the stones–no cement here, a dung and sand mixture holds things in place. 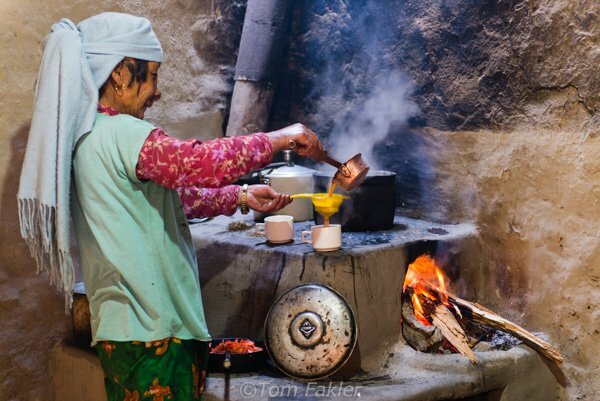 Together with the local workers, volunteers eat lunch each day in the gompa kitchen: a tasty, slightly spicy dal bhat, the Nepali national dish, which consists of steamed rice, cooked lentil soup (dal) and vegetables. Here, masala tea in the making. During our time in the Lower Mustang Valley, we took three short treks and a jeep trip. 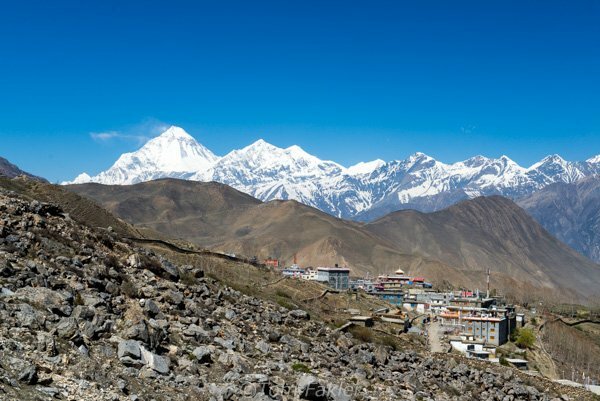 Our excursions to Marpha, Tukuche and Muktinath took us past green fields, along the Kali Gandaki River and through the Annapurna foothills. A day’s excursion by jeep provided vistas of snow-capped mountains. 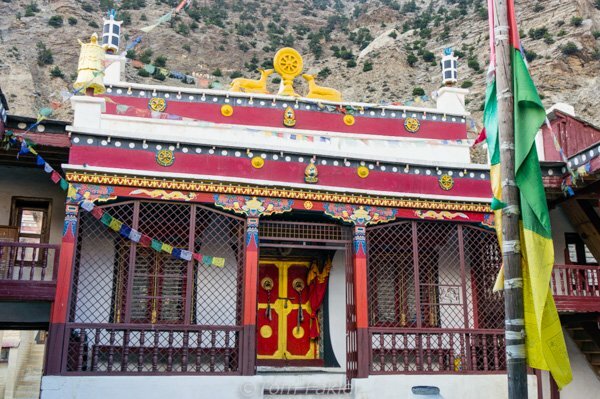 From Rita’s Gesthouse on the outskirts of Marpha, It is less than an hour’s walk through forests to Tukuche. A climb up stairs to this monastery perched on a hillside above Marpha affords great views of the town. Children in the village of Tukuche, where friendly locals welcome RWI volunteers, for visits to two gompas and a brandy distillery. My spring-time trip gave me a much-welcomed opportunity to return to the Himalayas (I had been to eastern Nepal some years ago). It was a joy to experience the clear skies and mountain views of a new part of the country. As a photographer, I enjoyed helping document work on the gompa; and I found the landscape and people to be rewarding photographic subjects. 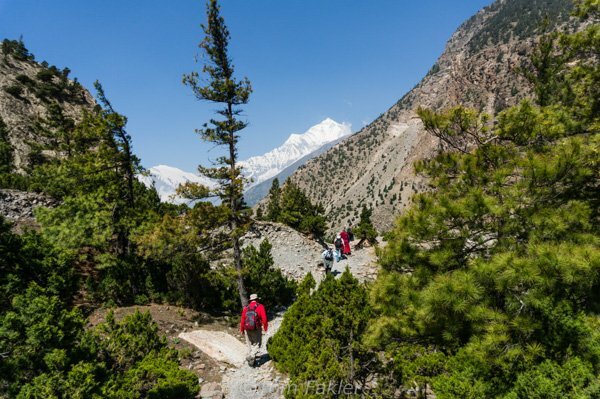 For RWI volunteers, the workday begins with a picturesque walk from Rita Guesthouse to Chhairo Gompa. 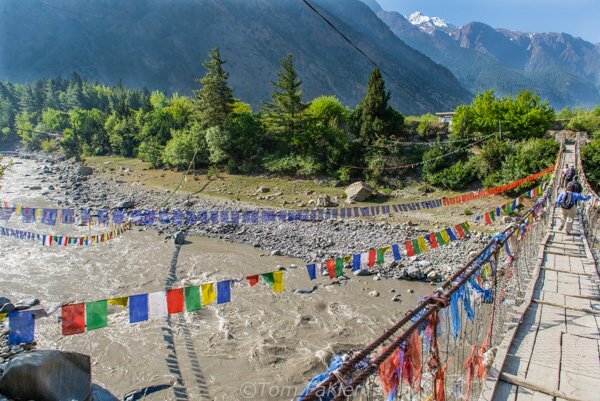 A suspension bridge draped with prayer flags crosses the Kala Gandaki River. 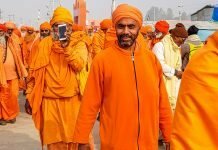 Are you interested in having your own Himalayan volunteer experience? For more information, and to join a trip to Chhairo Gompa, visit the RWI website. Thanks to Restoration Works International for the opportunity to join the spring 2013 trip as project photographer. I look forward to returning to Nepal with RWI! 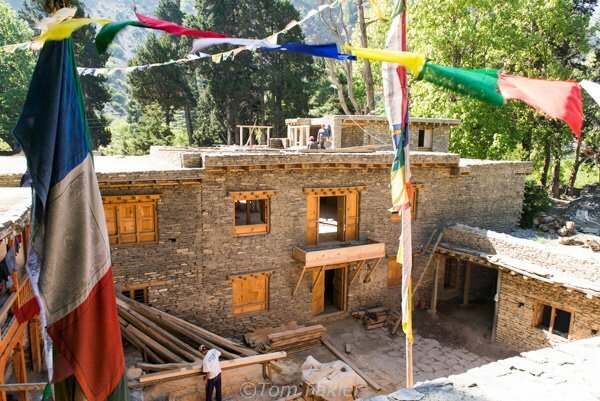 For more about our exciting trip, see my book: Restoring Chhairo Gompa.